Diamonds and pearls are both gorgeous, so why not use them both together in jewelry? There’s nothing more beautiful than pearl and diamond earrings. They’re also affordable if you know where to buy them. They can be worn on all occasions. They look great with formal wear, casual jeans, classic outfits, casual dresses, etc. If you want to buy these earrings as a gift, you can rest assured that your recipient will love them! Make sure that the pearls on the earrings are real and not fake. Fake pearls will take away from the beauty of the jewelry. A Tahiti or South Sea pearl offers a nice opulent look. When you lay your eyes on a fine pearl, you’ll realize why people are willing to dive way down deep in the ocean to collect these opulent spheres! 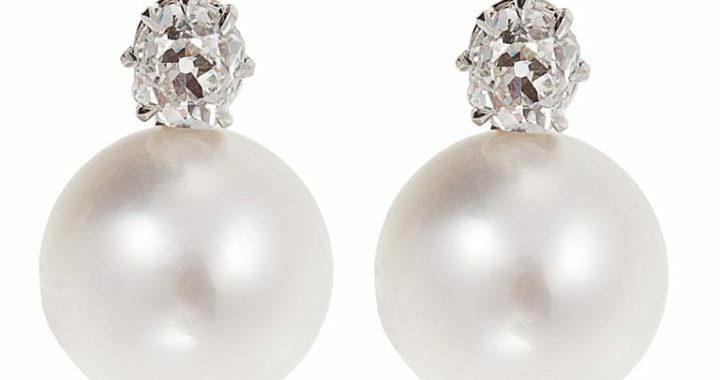 Here are a few tips for choosing pearl and diamond earrings. 1. Decide whether you want natural or cultured pearls. Natural pearls are rare and cost a fortune. If you can find a natural one, then the investment will be well worth it. However, these days most pearls are grown on farms. A technician will implant beads into the mollusks, and the mollusks are then returned in the water until the pearls form. 2. What quality of diamond can you afford? What kind of cut do you want? Princess and emerald cuts are especially lovely when paired with pearls. Do you want a single, large diamond to match the size of the pearl, or do you want a number of tiny diamonds accenting the pearl? 3. What style of earring do you want? Would you prefer something simple, like stud earrings, or something flashier, like dangle earrings? If you want something in between, then go with drop earrings. Drop earrings are ideal if you’re buying for somebody else. Some women have small, delicate ears and can’t wear dangle earrings. At the same time, stud earrings might be too simple for them. 4. Another factor to consider is whether you want freshwater or saltwater pearls. Saltwater pearls include Akoya cultured pearls grown in waters near China and Japan. They are white or cream in color. Freshwater pearls are grown in lakes and ponds, predominantly in China. They are produced in various sizes. They’re typically pastel in color, although some are white and resemble Akoya pearls. 5. Last but not least, you need to decide on the metal. White gold? Yellow gold? Silver? These are all lovely choices when combined with pearls and diamonds. Hopefully, you have an idea of which pearl and diamond earrings to buy. You at least have a starting point so that you can begin your search for the perfect pair! For the best deals on pearl and diamond earrings, check out SuperJeweler.com. You can find discounts on earrings, necklaces, rings, and more. You’ll find a variety of pearl and diamond jewelry pieces at impressive prices! Ruby Earrings Guide: What Should You Look for in a Ruby Gemstone? Which Earring Style is Ideal? Ruby is the birthstone for July. Ruby earrings make a perfect gift for anybody who was born in this month. The color symbolizes passion and love. Giving somebody ruby jewelry is a wonderful expression of love between two people. According to legend, this gemstone can strengthen the heart. • “Good” quality rubies have a slight pinkish tone to them. Since they are fairly light, you can see their natural minerals and inclusions. • “Better” quality gems are a medium red. They are a wonderful mix of brilliance and color. Some of the natural minerals are visible. • “Best” quality gems are bright and vivid red in color! They are among the rarest rubies in the world. This is the best option if you want to buy ruby earrings for your fiancé or wife. • Needless to say, “heirloom” quality gems are the rarest on Earth. They are truly extraordinary, represent the top 0.1% of rubies, and are a dark, brilliant red. The saturation quality is how deeply the color penetrates into the gemstone. The darkest and richest stones have highly saturated colors. Lightly saturated gemstones appear more pale and transparent. Like other gemstones, rubies undergo treatments to enhance their natural attributes. The treatments will enhance their color and strength without sacrificing quality. Be sure to order the earrings from a jewelry store that doesn’t use glass or lead-filled rubies. Your order should come with a Certificate of Authenticity. When choosing earrings, you need to decide whether you want a solitaire ruby or a ruby accented with diamonds. Ruby earrings are especially beautiful when they are combined with diamonds! One gorgeous design includes the ruby as the center, embellished by tiny white diamonds. If you want something simple, yet lovely, go with classic stud earrings. 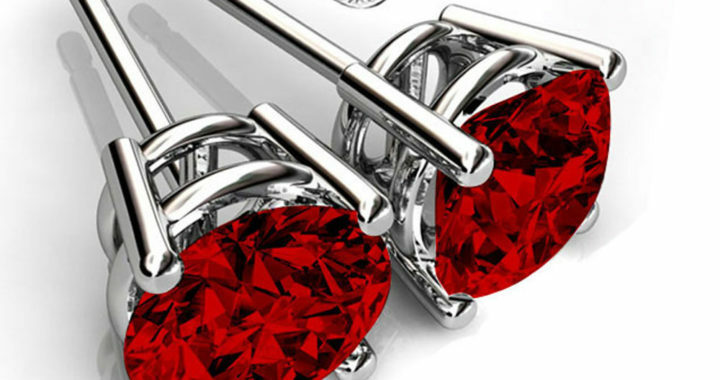 The rubies used in stud earrings typically range in width from 2.5mm to 5mm. More elaborate designs include two or three stones in a dangle setting. A tiered design especially looks gorgeous when the rubies are set in 18k gold. Speaking of gold, yellow gold is the most popular metal setting for rubies. There’s just something about a blood red gemstone combined with shining yellow gold! Last but not least, you need to consider the cut. Rubies can be cut into any style: heart, oval, emerald, pear, princess, etc. Heart shaped rubies are the most popular since the color is red. Ruby earrings, necklaces, rings, and bracelets can all be found at SuperJeweler.com. There are ruby earrings discounts available to help you save on the most stunning pairs! 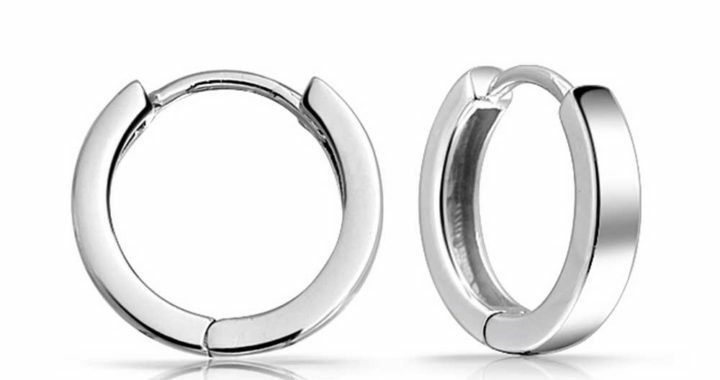 Silver hoop earrings go well with any type of outfit! You don’t have to wait until you’re wearing an evening dress or formal gown to put in a pair of hoop earrings. After all, hoops aren’t always large. Some hoops are quite small. These earrings are available in a variety of sizes. Sometimes the sterling silver is quite plain. Some of the hoops feature crystal or gemstone accents. There are a number of things to consider: your own tastes, the size of the hoops, the size of your ears, whether you want plain hoops or hoops accented with diamonds or crystals, etc. One of the most important considerations is comfort. If you have small, delicate ears, you probably shouldn’t wear large, heavy earrings. Keep them small and light. If they are too heavy for your ears, you will feel really weighed down. 1. Think about your lifestyle. Do you want something casual? Then go with petite earrings with minimal embellishments. Do you want something fancier? You can go with larger loops with diamond accents. If you spend a lot of time outdoors, go with some huggie-style earrings. 2. When determining the size of the earrings, keep in mind that medium hoops are between 1 inch and 1.5 inch in diameter. These are the most versatile since they aren’t too large or too small. 3. Consult your own wardrobe for some ideas on which hoops to go with! If you have a lot of designer clothing, you’ll need at least one pair of large hoops, at least 1.5 inch in diameter. If you have a lot of suits in neutral shades, your best bet is a pair of petite hoops. For a lot of casual clothes, you can stick with medium hoops. 4. Decide whether or not you want the earrings to be embellished with crystals or diamonds. Some designs also feature “twisted” shapes. And then there are earrings that feature a symbol inside of the hoops. This symbol can be a dolphin, cross, rose, or even a name! 5. Why settle with just one pair? Why not diversify your wardrobe by buying a few different earrings. Try to get at least one pair that will be noticeable at a special event. There should be a few different pairs for everyday wear. 6. Last but not least, you need to consider your budget. The great thing about sterling silver is that it is an inexpensive metal. 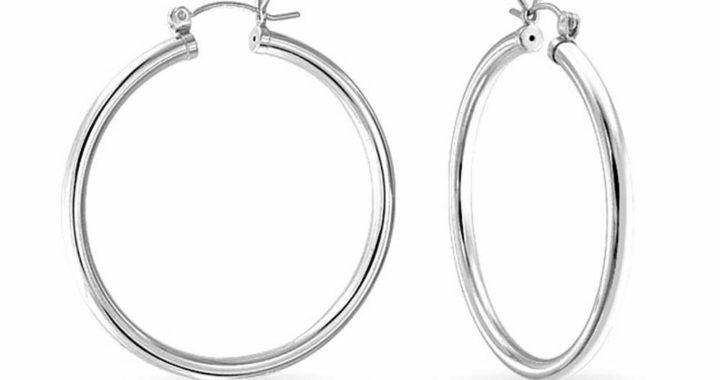 You can find a good pair of silver hoop earrings for less than $100. Of course, if you want diamond or crystal embellishments, you should expect to pay more. Now that you know what to look for in silver hoop earrings, you can order them at SuperJeweler.com! You will find huge discounts on any silver jewelry you want. Super Jeweler is the leading internet jewelry store. They offer huge deals on all of their jewelry AND on shipping and handling! 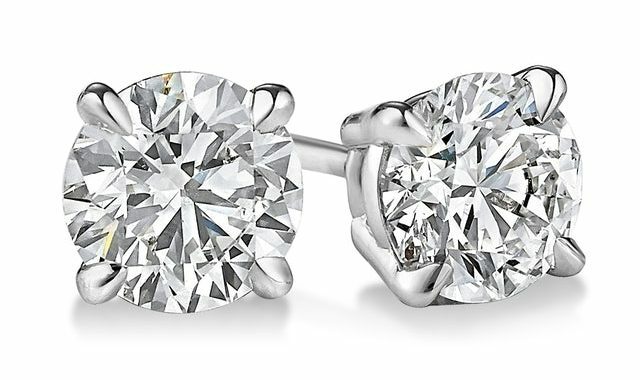 Every woman should have at least one pair of diamond stud earrings. They make both a simple and elegant fashion statement. They look great with any type of outfit. Whether you want to buy a pair for yourself or as a gift for somebody else, you will find that there are a variety of styles and sizes to choose from. Keep in mind that no two diamonds are exactly alike. When it comes to stud earrings, you need to make sure you choose the right pair. Even if you can’t afford an expensive pair, you still don’t want to waste your money on a tacky pair. • Decide on the cut, as it’s one of the most important aspects of a diamond. An ideal cut gives a diamond its brilliance and scintillation. If cut properly, the facets allow the maximum amount of light to enter through the top. When the angles are correct, the light that enters through the top will be dispersed. Earrings are available in cuts such as brilliant rounds, emerald cut, princess cut, and oval cut styles. • Another aspect to consider is the clarity. It’s essential that you buy diamonds with the fewest amount of flaws possible. If the inclusions are noticeable to the naked eye, the stones aren’t nearly as beautiful as they should be. • Next, think about the color. Diamonds are available in every color imaginable, ranging from clear to pink. Most people consider completely colorless diamonds to be the most luxurious, although red, blue, and pink diamonds are becoming more and more popular. • What kind of setting would you prefer the stones to be placed in? Yellow gold? White gold? Silver? How many prongs? When it comes to stud earrings, you might want to avoid crown style settings, as they are a poor fit. The best fits are 3-prongs and 4-prongs. • Lastly, consider the carat. The carat is the unit of weight by which a stone is measured. Where stud earrings are concerned, you don’t want to go with heavy diamonds since they might feel uncomfortable. They are generally available in 1 carat sizes, ¼ carat, ¾ carat, and 1/3 carat. Now that you know what to look for in diamond stud earrings, you can begin shopping for that perfect pair. The price can range from just over $100 to five figures, depending on the four Cs and the setting. Go with the highest quality you can afford. The best place to shop for diamond stud earrings is SuperJeweler.com. You will find great deals on diamond earrings as well as necklaces, rings, bracelets, and more. SuperJeweler is a leader in the jewelry industry, and always offers quality pieces. When a woman enters a room wearing diamond hoop earrings, you can be sure that everybody will take notice. Dangle earrings made with diamonds are exquisite – especially when they’re placed in the right setting. The settings and size of the hoops vary a great deal. Selecting the perfect pair isn’t as easy as you might think. If you’re buying them as a gift for somebody else, you need to know their personal taste in order to pick out the right pair. 1. One of the most important considerations is size. Do you want large and thin hoops, or wide huggie-style earrings? If you’re buying for someone else, think about the size of their ears. People with smaller ears generally prefer smaller hoops. Also, how many hoops do you want to go with? Some earrings have two or three rows of hoops. 2. Next, consider the metal in which you want the diamonds placed. Do you want the earrings to be yellow gold? White gold? Platinum? Silver? Yellow gold offers amazing contrast, although silver diamond hoop earrings are classier and more beautiful on a subtle level. 3. When it comes to the setting, how many diamonds do you want? One diamond at the end of a hoop, or a series of diamonds placed all around a hoop? What about the size? It’s common sense: the more diamonds a pair of earrings has, the smaller they tend to be. An exception is a pair with small stones surrounding the hoop and a large diamond dangling from the bottom. 4. Another thing to consider is whether or not you want diamonds to be the only stone on the earrings, or if you want other gems complementing it. 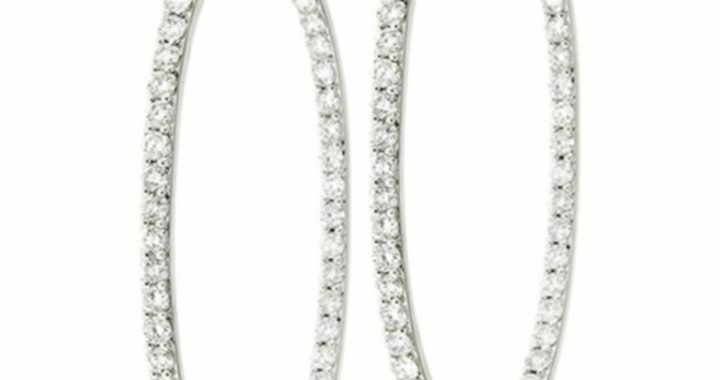 Hoops with alternating diamonds and rubies or sapphires are always a popular choice. Many women also love hoops with alternative white and pink diamonds. 5. What kind of cut would you prefer the diamonds to be? Both round and baguette diamonds are popular choices. Round brilliants give off the most dazzle and sparkle, although the cool, classic cut of baguette and emerald style diamonds appeal to some people as well. 6. When shopping for the perfect pair, you need to decide on the carat of the diamonds. As mentioned above, they are available in a variety of sizes. Common carat sizes for hoop and huggie-style earrings include ½, 1/3, ¾, and 1/5. You should now have an idea of what to look for when shopping for diamond hoop earrings. Whether you want to buy a pair for yourself or as a gift for someone else, you need to make sure you choose the right size, cut, setting, and style. You can find plenty of gorgeous diamond hoop earrings to choose from at SuperJeweler.com. You will find everything from black diamond hoops to sparkly flipback diamond earrings. SuperJeweler is notorious for giving out amazing discounts on their products, including diamond hoops. Blue Diamond Earrings Guide: What Are Popular Styles? Which Design is Right for You? If you want jewelry with blue gemstones, don’t settle for anything less than blue diamonds! Blue diamond earrings are beautiful. No matter where you wear them to, you will be the center of attention. Whether you want to wear studs, hoops, drops, chandeliers, or heart shaped earrings, you will find this icy colored diamond to be very beautiful. That being said, no two blue diamonds are exactly alike. In fact, they’re not all made the same way. Some form naturally and some are produced in labs. Very rarely will you find them untreated. In nature, they get their blue color from inclusions in the crystal lattice structure. The clarity and purity of a blue diamond plays a huge role in its price. Another factor in the price is the carat. You really don’t need HUGE diamonds in earrings, or else they’ll drag your ears down! 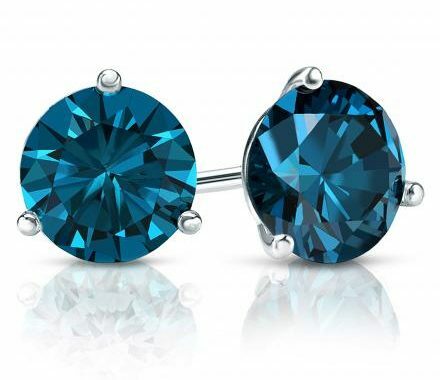 For this reason, blue diamond earrings are less expensive than necklaces and rings. There are a variety of styles, cuts, and designs to choose from. For a simple style, you can go with stud earrings with a round or square cut. Prong-set stones are typically 1 carat or less. Even small studs can really stand out – especially if they are set in polished silver or bright gold. Another gorgeous style is an icy blue diamond surrounded by white diamond accents. The main stone can be crafted into sterling silver with a pave pattern. You will find that many earrings have other diamonds and crystal accents along with the blue stone. Teardrop earrings are always a popular choice – especially if they feature gleaming blue diamonds crafted in gold! Some even have art deco inspired designs. These earrings feature sparkling diamonds that sit above a square cut gemstone. The blue diamonds don’t always have to be featured with white diamonds. They look very lovely when complemented with black diamonds as well. You can’t go wrong with hoop earrings! When embellished with blue diamonds, and crafted from white sterling silver, hoop earrings are absolutely gorgeous! Another hoop design is blue and white diamond hoops featuring treated diamond baguettes. They look best set in white gold or platinum. Want something unique? You’ll find some earrings featuring stars, flowers, snowflakes, horseshoes, and dolphins embellished in blue diamonds. Clearly, there are so many choices, so you can easily find the perfect pair of blue diamond earrings. If you really want to go all out, order a complete set! Get a matching ring, necklace, and bracelet. At SuperJeweler.com, you can find many blue diamond earrings at discount prices. You’ll be surprised at how affordable blue diamonds can be! Super Jeweler offers superfast shipping and excellent customer service. You just can’t go wrong with silver earrings. They are available in so many styles, shapes, designs, sizes, etc. Just because silver isn’t as valuable as gold doesn’t mean it’s not elegant. In fact, many people – especially women – prefer silver over gold due to its cool, yet striking color. The great thing about silver earrings is that they look great with just about any outfit. You can wear them to work or school. You can show them off at a formal event. You can don them when you workout. No matter how or where you choose to wear them, you can trust that people will take notice of them. Since silver is a neutral color, they won’t look tacky, no matter what kind of outfit you choose to wear with them. That said, you still need to realize that not every style is appropriate for every occasion. For instance, it wouldn’t be a good idea to where a pair of silver hoop earrings when you go jogging. Nor would be ideal for you to wear a small pair of silver stud earrings when you attend a formal event. For this reason, it’s in your best interest to own a few different pairs. That way, you’ll always have some nice silver earrings to wear, no matter where you go. The earrings don’t have to be made entirely out of silver, either. There are two-tone earrings which include two metals, usually either silver and yellow gold, or silver and rose gold. This day and age, you can order modern style earrings or vintage style earrings. If you prefer the classic look of vintage earrings, you can order replicas made out of new materials. Another thing to consider is how simple or elegant you want your earrings to be. Even a pair that is simply made out of silver can be very beautiful. But if you really want to go all out, you might want to get a pair with a intricate design. How about a pair of silver dangle earrings with diamond embellishments? Or a pair of hoop earrings made out of silver and Swarovski crystals? If you want something a bit more than stud earrings, but don’t want long dangles or hoops, you can go with a huggie pair. These cute earrings barely circle around your earlobe. Some are solid silver while others feature tiny gemstones or crystal embellishments. Now you have some ideas of what to look for in the perfect pair of silver earrings. As mentioned above, you should go with a few different pairs – especially if you have a versatile wardrobe. Just look online for some ideas of which styles will suit you the best. You will find all of the pretty silver earrings you could ever ask for at SuperJeweler.com. This is the #1 jewelry store on the World Wide Web. You will find everything from certified diamonds to simple silver jewelry – all at affordable prices. When it comes to silver earrings, the designs are almost limitless! One of the most popular designs is a heart. This simple symbol can convey a powerful and deep message. If you want to buy silver heart earrings for your girlfriend or wife, you’ll be glad to know that it’s easy to find some within your budget range. They are available a variety of styles: studs, hoops, dangles, etc. On some earrings, the heart dangles down below the post. On others, the symbol extends from the post as a stud. Some designs feature solid hearts and some feature the outline of a heart. 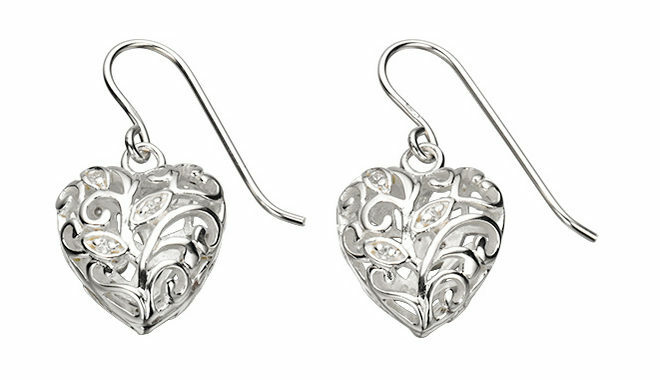 How dazzling do you want the silver heart earrings to be? Do you think she’ll like something simple? Or will she want the heart to be embellished with crystals or diamonds? Even though plain silver hearts aren’t anything fancy, they are still beautiful in their simplicity. They go well with any outfit! She can wear them every day, regardless of how she is dressed. On the other hand, most girls do prefer a bit of color on their jewelry. Silver complements any gemstone or crystal. The most obvious colors to go with are red and pink, although heart shaped jewelry looks beautiful in any color. Another thing you should consider is the size of her ears. Some girls have small, delicate ears and can’t wear heavy earrings. If her ears are small, you should go with small hearts. Chandelier or heavy hoops with hearts are out of the questions. If her ears are averaged size, it probably wouldn’t be as uncomfortable for her to wear heavy or large earrings. What kind of style does she have? Is she a t-shirt and jeans kind of girl? Then her silver heart earrings don’t have to be anything fancy. Is she a fashionista who always has to wear the latest designer clothes? Your best bet is to go with a designer pair of earrings! Is her style fun and flirty? Then the prettier the earrings, the better. If you’re still unsure, then you can just stick with her birthstone. You should be able to find a pair of heart earrings featuring her birthstone set in silver. Rhinestone is a good alternative if you can’t afford a gemstone. Heart shaped earrings can look very stunning when embellished with rhinestones! An unconventional, yet cute design is heart earrings embellished with black diamonds! Black diamonds look great with any outfit. They cost more than other diamonds, but they are a good choice for the girl who prefers unconventional jewelry. You’ll find tons of cute silver heart earrings at SuperJeweler.com. 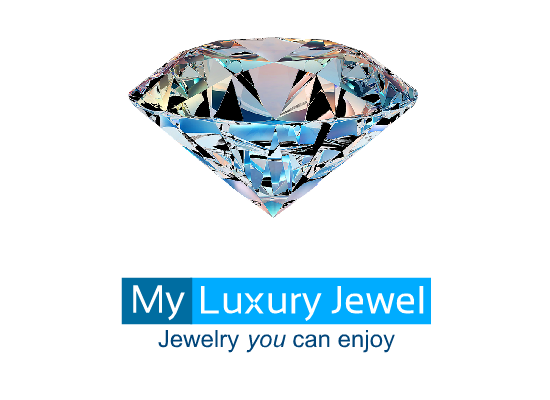 Super Jeweler is the #1 jewelry website! The store offers unbeatable discounts on earrings, necklaces, rings, bracelets, etc. There are always HUGE deals running at any given time! Are you looking for a good pair of earrings that will complement any outfit? Black diamond earrings are a good choice! They can be simple, dramatic, and everything in between. While not as popular as traditional diamonds, they are just as gorgeous. They can be striking and dramatic. Even if you go with a simple pair of earrings, you will still turn heads with black diamonds. They are also referred to as carbonados diamonds. This name was coined by the Portuguese in Brazil during the mid-18th century. It is visually similar to porous charcoal. In their natural form, black diamonds are only found in Brazil in Central Africa. They have trace elements of hydrogen and nitrogen, which indicates that they might be extraterrestrial in origin. That’s right – black diamonds originate in outer space. This gives them a sense of mystery. This is one of the reasons why so many people are drawn to them. So, what kind of black diamond earrings are available? The styles, designs, cuts, and settings are almost limitless! The prices vary depending on the clarity and size of the black diamond. Want to add a touch of pizzazz to your attire? Go with moonlight diamond studs. Want something dramatic? Perhaps hoop earrings are more of your style. Dangle earrings accented by black diamonds, set in sterling silver, are popular – especially if the diamonds are set amidst black rhodium plating! A pave pattern can give the illusion of more stones. Another popular choice is a square-shaped design set in sterling silver. If the sterling silver has pave detailing, the earrings have the appearance of sparkling white stones surrounding the frames. If you’re going on a date, heart-shaped earrings might be a good choice. They really sparkle when accented with black diamonds. There are also black diamond earrings cut into shapes like stars, flowers, swirl drops, and dolphins. The style can be as simple as small studs to as elaborate as chandeliers. You can choose earrings with one or multiple black diamonds. Some are also accented with uncolored diamonds or other stones. One very beautiful and bold design is black diamonds, uncolored diamonds, and blood-red garnet! For a crazy, bold, and unique design, you can go with a checkered design of white and black diamonds. These earrings are fairly large and feature a rhodium plating for extra shine. They are set in sterling silver. You can find the best deals on black diamond earrings online. There are tons of settings, cuts, and styles to choose from! It’s easy to find the perfect pair of earrings to suit any occasion. 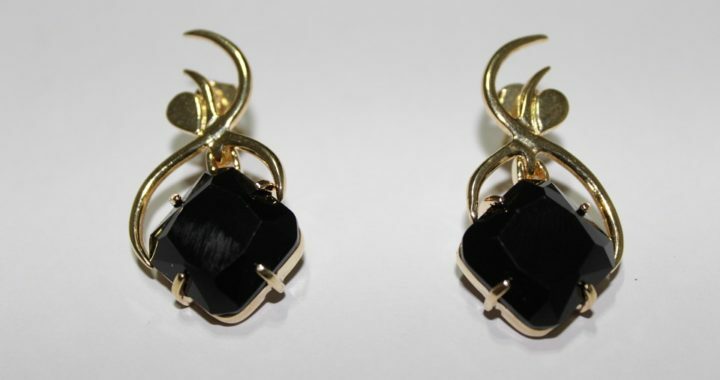 Black diamond earrings are available at SuperJeweler.com. You can choose stud earrings, hoops, dangle earrings, etc. Super Jeweler offers unbeatable prices and free shipping and handling. Check out all of the black diamond earrings as well as necklaces, rings, and bracelets.